Pharmacy students from the class of 2022 participated in Philadelphia College of Pharmacy’s annual White Coat Ceremony on September 22, 2018. The ceremony is an annual rite of passage for first professional year students in the six-year doctor of pharmacy program. Students receive a white coat symbolizing their dedication to the profession of pharmacy. They took the Oath of a Pharmacist with their peers as their families and faculty witness. 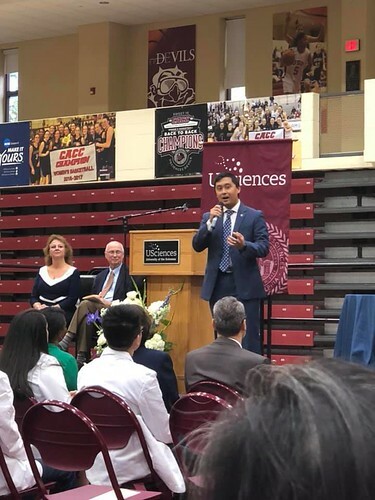 Michael C. Dejos PharmD ’13, Medical Safety Officer Nemours Alfred I. duPont Hospital for Children, gave the keynote address at the ceremony. Dr. Dejos is a leader within patient safety, healthcare, pharmacy, and public health. He leads the medication safety committee, performs medication error investigations, and implements medication-use process improvement projects. A graduate of USciences’ Philadelphia College of Pharmacy, Dr. Dejos continues to challenge the status quo of healthcare delivery by identifying alternative ways to handle medications throughout the medication-use process in a safer and more effective way.